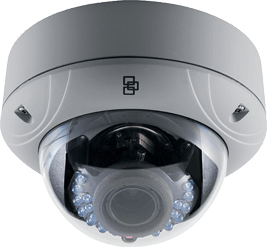 The TVD-1104 is a Full HD IP Outdoor IR Dome camera is designed to perform in a wide range of lighting conditions. Its built-in IR LEDs provide illumination up to 15 meters to ensure images – even in low light environments. The camera’s Digital Wide Dynamic Range feature ensures that images are obtained, even in backlight scenes. The camera is compliant with the ONVIF and PSIA open standards.